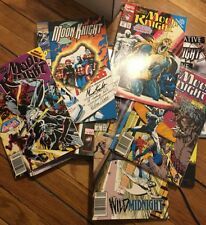 🔥 1980-2000s MARVEL MOON KNIGHT COMIC BOOK SALE $1.95 EACH + FREE SHIPPING! Nice lot of comics. I have zero expertise in comic books and ended up with about 250 Marvel books by mistake (more about below). 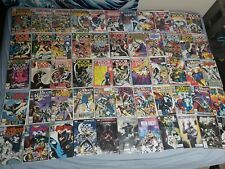 All in lot are Moon Knight they are as follows 33 Marvel Comics. 34 Marvel Comics. A VF copy of Moon Knight 35. By Tony Isabella and Kevin Nowlan. Double sized direct issue guest starring the X-men and the Fantastic four. Comes bagged and boarded, take a look. Combined shipping is available. One copy of Moon Knight #29 graded CGC 9.6 with white pages. It was published in 1989 by Marvel Comics. This book is in Very Fine condition. This would make a great addition to anyone's collection! (Marvel Comics, 1980) CGC Graded 9.6! MOON KNIGHT #1. This copy is CGC Graded 9.6! ~ White Pages. Comic is in Near Mint Plus (NM ) condition. Published by Marvel Comics in 1984. (check out pics. /excuse glare). Doctor Strange appearance! In my estimation the book ranges in "NICE" (7.0) FINE/VERY FINE to (7.5) VERY FINE- condition. Very moderate wear to cover, spine, corners & edges. Published by Marvel Comics in 1984. (check out pics. /excuse glare). 2nd to last issue! In my estimation the book ranges in "NICE" (7.0) FINE/VERY FINE to (7.5) VERY FINE- condition. Very moderate wear to cover, spine, corners & edges. This issue has been previously read and remains in Very Fine Condition. I am by no means a professional comic book grader. Quality of comics are in pictures provided. With Spider-Man Bushmaster. Moon Knight / comic story / 22 pages. Hunter's Moon. -from Marvel from 1989. We will take great care in processing your order. I grade as accurate and tough as possible-. This issue has been previously read and remains in Fine/Very Fine Condition. This issue has been previously read and remains in Very Fine- Condition. One copy of Moon Knight #25 graded CGC 9.6 with white pages. It is in NM/M condition with white pages and has been certified by CGC grading. This is fresh back from CGC so the case is in excellent condition with no scuffs or cracks. Moon Knight #38 CGC 9.8 Cover: W.M. Kaluta Art: Bo Hampton Story: Alan Zelenetz Last Issue Black Cover. Moon Knight #27 (1980 Series)Cover: Frank Miller & Terry AustinStory : Steven GrantInterior Art : Brozowski & Dzublin. MARC SPECTOR MOON KNIGHT Lot including #'s: 1-54 & 1992 SPECIAL (range from Fine to Very Fine with the following exceptions: 21 Very Good, 28 Fine, 42 Good/Very Good, & 43 Good/Very Good). I refuse to grade anything Near Mint. The cgc case is mint. 8376 State Rd. Sweet Lou's Collectibles. MARVEL SPOTLIGHT on RED WOLF #1. VF condition. From MARVEL comics. 1990 MARVEL MOON KNIGHT #15 HIGH GRADE. THE COMICS IS IN VERY NICE SOLID CONDITION, SEE PHOTOS FOR CONDITION. i COMBINE SHIP. Shipped with USPS First Class Package. Moon Knight #24 1st Scarlet Appearance! Bill Sienkiewicz Cover! Moon Knight #24, This issue is aboutF/VF, Book might even grade higher. I am not a professional grader, and may undergrade to be safe. Check out the scan, and you make up your own mind. Fist of Khonshu Moon Knight 1985 series. Marc Spector: Moon Knight 1989 series. 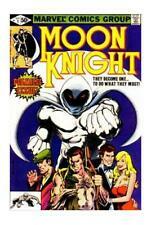 Moon Knight 1980 series. #17 - 2nd copy. As a little kid, I bought them at flea-markets. #18 - 2nd copy. #15 - 2nd copy. MOON KNIGHT 11 BOOK LOT! KEY ISSUES! For sale is an 11 book lot of Moon Knight comics including Vol 1. #2, 3, 4, 25 (first Black Spectre), Vol 2. #57 (Platt homage cover), 58, 59, 60 and Vol 3. #1, 2 & 3! This is a upper-mid to high grade lot! My description is meant to be a guide, please see detailed photos and judge condition for yourself. Books will be packed and shipped with caution to preserve condition. See my 100% positive feedback and bid with confidence! Please see my other listings for more great comics! MARVEL COMICS / 1st Printing / KALUTA cover. MOON KNIGHT (1980) #38. VERY FINE (VF) condition. TRADING COOL COLLECTIBLE COMICS ONLINE SINCE 2002. LOW PRINT RUN! All comics bagged & boarded . COLLECTING COMICS SHOULD BE FUN! NM . Shipping is Free. Marc Spector: Moon Knight #1. Marvel 1989. Key Bronze! White Pages! From Werewolf #32! This is a Moon Knight #38 Last Issue CGC (Marvel 1984). The book is CGC graded 9.4 NM, White Pages. See pictures for more details. WE CURRENTLY HAVE MANY OTHER CGC COMICS INCLUDING STAN LEE AND OTHER SIGNATURE SERIES COMICS. HAND-SIGNED BY SIENKIEWICZ & MOENCH the writer & artist of the series on 7/09 ! MOON KNIGHT #23 CGC 9.4 Signature Series. CGC rated as a 9.4. These comics are in mid to mid/high grade condition. THE AMAZING SPIDER-MAN #280-289 10 ISSUE RUN MID TO MID/HIGH GRADE CONDITION. RUN BOX #5. CHECK OUT OUR OTHER LOTS. REFER TO PICTURE. MOON KNIGHT V.1 #32 33 34 35 (1983) X-MEN Doug Moench High Grade White Pages! This set is in the "CGC worthy" range - white pages, sharp corners, nice spines 9.2-9.6 in my opinion. These books are increasing in value quickly, particularly in high grade.